Throughout the month of October, Sacramento residents will be lacing up their walking shoes to celebrate the October is Walking Month or “Walktober”. With cooler weather in the forecast, October is the perfect month to get out and walk to work, school, or replace a car trip with walking to an everyday destination. Held on the second Wednesday of every October, Walk to School Day is an internationally recognized event to celebrate the benefits of active transportation by encouraging school children and their families to walk, bike, and roll to school. Walk to School Day events are part of a larger Safe Routes to School program at schools that seeks to increase the number of students who walk and bike to school through encouragement programs as well as near-school safety improvements. Reducing the risk of injury to pedestrians includes teaching children age-appropriate walk and bicycle skills, reminding drivers to slow down in school zones, and identifying hazardous conditions along routes to school that need to be improved. In addition, Walk to School activities can help children achieve the minimum of 60 minutes of physical activity on most days of the week as recommended by the U.S. Surgeon General. WALKSacramento has been overseeing Safe Routes to School programs in the Sacramento Region for over 15 years and has recently expanded to new schools for the second year in a row in Sacramento City Unified School District and Washington Unified School District. Several of the schools in these districts will be celebrating their very first Walk to School Day event this year. Schools in Natomas and Elk Grove Unified School District will be celebrating as well. "More students walking and biking to school means healthier students who are ready to learn, safer streets, and renewed pressure on cities and counties to commit to making transportation safety a priority. For the benefit of our health, environment, and economy, creating a culture of safe, active transportation within our schools is critical to Sacramento’s future. "- says Kirin Kumar, WALKSacramento's Executive Director. For more information on events, contact Molly Wagner, mwagner@walksacramento.org unless otherwise indicated. Over 40 schools will participate in Walk and Roll to School Day activities in the Elk Grove Unified School District. For more information on schools holding events, download the pdf of events here. Contact Elyse Chadwick for more information about Elk Grove Unified events, echadwic@egusd.net. 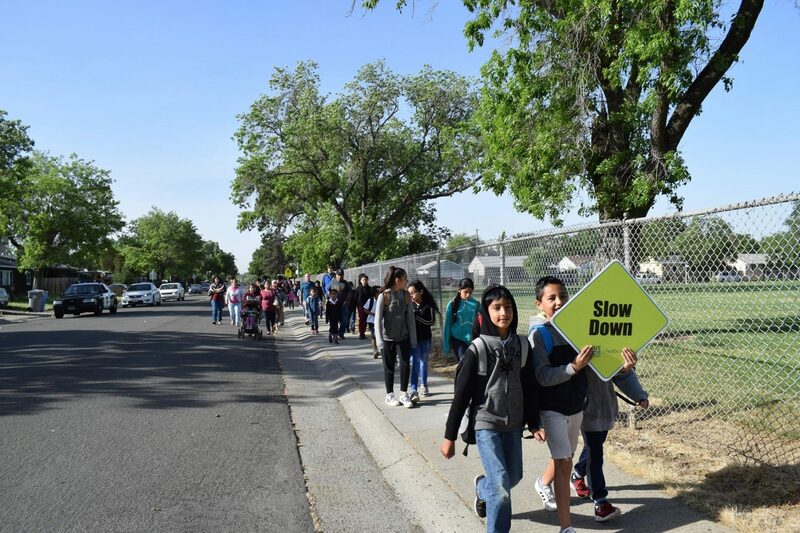 As a way to engage families and boost participation in our local neighborhoods, North Natomas Jibe is hosting special Walk to School Day events at eight North Natomas partner schools, with hundreds of participants at each school site. These events kick-off a locally-based “Walktober” campaign – a challenge that combines students’ morning walk distances in an effort to collectively “walk across America”. This challenge is designed to improve health, safety, traffic conditions and air quality, all while fostering better community ties. Walk to School Day festivities will include organized walking groups, Walking School Buses, which will meet offsite and walk in to school together, arriving to campus to a DJ dance party and a free breakfast for all participating students and their families. Contact Mellissa Meng for more information about Natomas events, mellissa@jibe.org. If you are interested in participating in a WALKSacramento sponsored Walk to School Day event or hosting a Walk to School Day event at your school, please contact Molly Wagner, mwagner@walksacramento.org for more information. 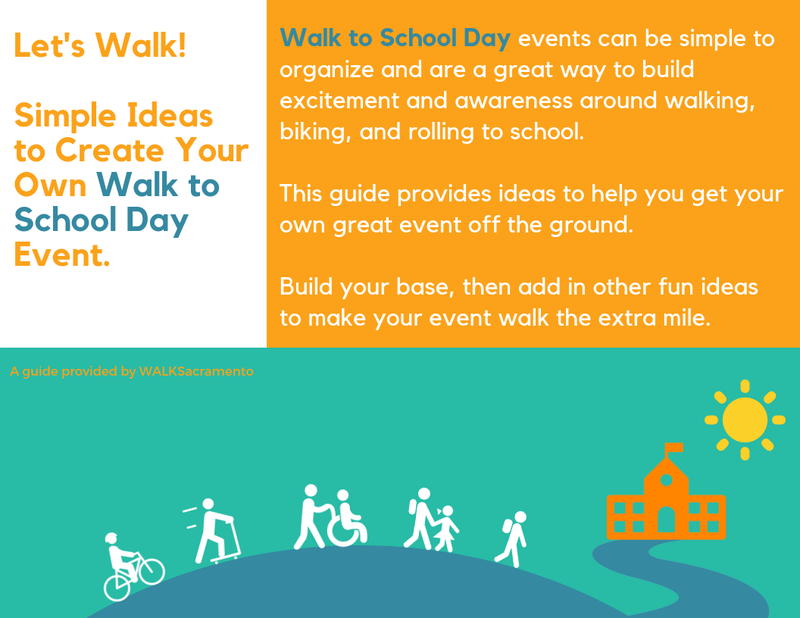 Walk to School Day Guide!